CLIO 12 is the Next Step forward in the CLIO software family of products for the CLIO System, building up the well-known CLIO 11 measurement suite. The CLIO System with CLIO 12 software is a complete audio and electro-acoustic measurement instrument that gives state-of-theart solutions to laboratory, on-field and production-QC applications. CLIO 12 is designed to support and drive the existing hardware like the FW-02 Audio interface and is ready to accommodate its future developments; operating system support has been extended to the latest Windows 10. 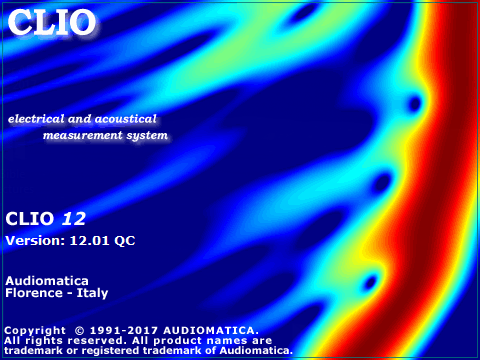 CLIO 12 is a system: it is including the Audiomatica CLIO FW-02 interface as hardware and it is running the CLIO 12 STND Standard Software or CLIO 12 QC Quality Control (which has also extended features not only related to Quality Control). These two parts (hardware plus software) can not function separately. The FW-02 USB Audio Interface sets new hardware precision standards for the CLIO System. CLIO 12 Software is the new measurement software for the CLIO System. CLIO 12 software is fully compliant with XP, Vista, Windows 7, 8 and 10. Compared to other measurement systems, CLIO 12 concentrates the power of many different instruments into a single one. FFT, RTA and ‘Live’ Transfer Function letting you the choice of any stimulus, even music. While other instruments offer one single possible measurement choice, CLIO 12 permits you to view the physical phenomenon like frequency response, impedance or other parameters, from different points of view. The final result will be then validated by the consistency of these measurements: as any expert technician knows, this is the correct approach that should always be adopted. Time-Frequency Analysis to evaluate Cumulative Spectral Decays, Energy Time Frequency, Wavelet Analysis and Cycle Wavelet Analysis. Either as 3D plots or Color Maps. CLIO 12 STANDARD: Laboratory grade software with most of the features present. CLIO 12 QC: Adds a Quality Control Processor for state-of-the-art testing and controlling a production line; also adds some particular applications like 3D measurement analysis. The Quality Control software extension for CLIO is a powerful suite for executing state of the art production line testing. CLIO QC implements all the measurement techniques found in the CLIO standard software adding a versatile script processor that handles the test sequence most appropriate for your needs. CLIO QC is able to test the production of loudspeakers, drivers, microphones, amplifiers and any other electroacoustic device. CLIO QC can interact with external hardware or production line controllers in addition to PC peripherals, computer networks or with custom written software to implement a fully automatic test line. CLIO QC can be configured to act as a measurement server. It is possible to easily integrate the sophisticated QC measurement techniques of CLIO inside custom written applications. Interaction takes place with TCP/IP transfer protocol giving the possibility of remote control over a network. Compared to other measurement systems, CLIO 12 concentrates the power of many different instruments into a single one. If you are still using a previous CLIO version with FW-01 hardware you should consider to upgrade to CLIO 12. There have been many advancements with CLIO 12 release, which is the current software version under active development. The new FW-02 hardware has USB connectivity instead Firewire, guaranteeing a stable and trouble-free communication between CLIO box and ensuring compatibility with recent PC hardware. If you want your hardware updated to the new USB fw-02 interface with CLIO 12 software please contact us at support@audiomatica.com.